SAPPHIRE Technology has now added two new Vapor-X Models to its HD 7970 series of high performance graphics cards based on the latest HD 7970 GHz Edition GPU from AMD. The SAPPHIRE HD 7970 6GB Vapor-X Edition shares many of the features of the recently announced industry-leading TOXIC Edition. Its 6GB frame buffer makes it ideally suited to multi-screen gaming as well as providing the extra memory required for demanding professional applications such as content creation, video editing or rendering. On its standard settings, the SAPPHIRE HD 7970 6GB Vapor-X Edition runs at 1000 MHz and with PowerTune Dynamic Boost rises to 1050 MHz on the engine with the memory clock at 6000 MHz effective. When the Dual BIOS button is operated, the core clock speed is raised to 1050 MHz with PowerTune Dynamic Boost to 1100 MHz on the engine. The fan profile and PowerTune limit is also changed to performance settings. In addition, users will be able to individually tune the card with SAPPHIRE TriXX, the company’s free to download software tool that allows key parameters to be adjusted for maximum performance. Stable performance at these enhanced speeds is ensured by the sophisticated power control system developed by SAPPHIRE. The Vapor-X Dynamic Power suite has many premium design features. These include a 10 phase power design, double sided Black Diamond Chokes as well as DirectFET technology and all mounted on a 12 layer PCB to ensure the board runs fast and stable. For additional peace of mind, a series of LEDs display PCB temperature. Output configuration of the 6GB model is Dual-link DVI-I, DVI-D, HDMI and two mini DisplayPorts. 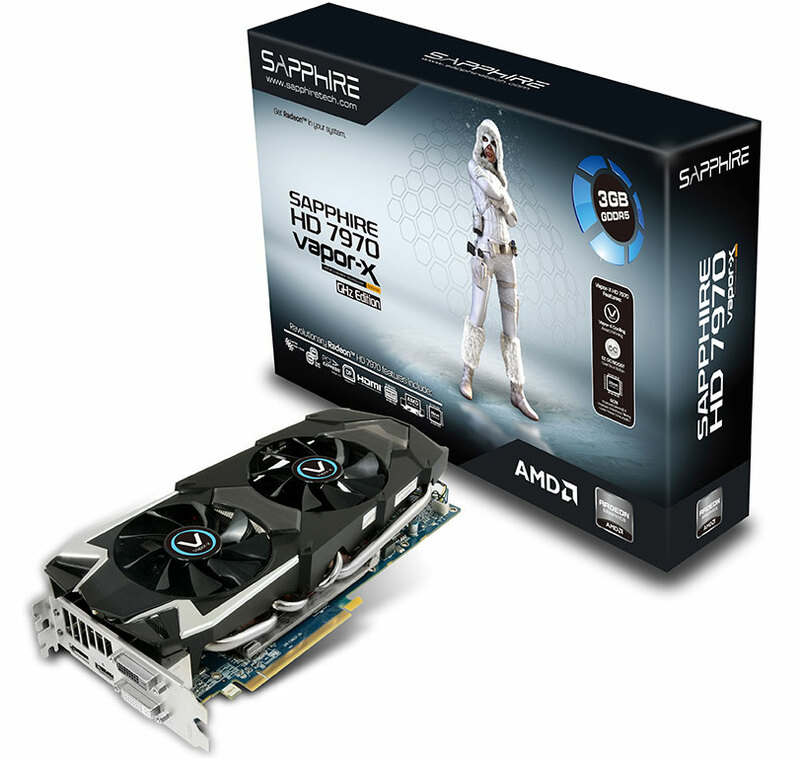 The second new model is the SAPPHIRE HD 7970 3GB Vapor-X Edition delivering similar high performance at a more aggressive price point. It has 3GB of the latest GDDR5 memory clocked at 6000MHz effective, and runs with a core clock speed of 1000 MHz which with PowerTune Dynamic Boost rises to 1050 MHz on the engine. It has a slightly less sophisticated 8-phase power design and the versatile output configuration of Dual-link DVI-I, DVI-D, HDMI and DisplayPort. The Vapor-X cooler on both these models is based on a new vapor chamber designed especially for this series. Heat is carried away by four heatpipes (2 x 8mm plus 2 x 6mm), and finally dispersed by two 90mm fan with aerofoil blades and dust repelling bearings. The Vapor-X cooler easily handles the heat generated from the HD 7970 GHz Editions even under extreme load conditions. Both SAPPHIRE HD 7970 Vapor-X Editions are based on AMD’s Graphics Core Next architecture and support all the latest demands of multi-screen applications, multi-threaded Application Acceleration with stream processing, fast HDMI support for high resolution and stereoscopic 3D displays and all the Direct Compute features incorporated in the latest operating systems. 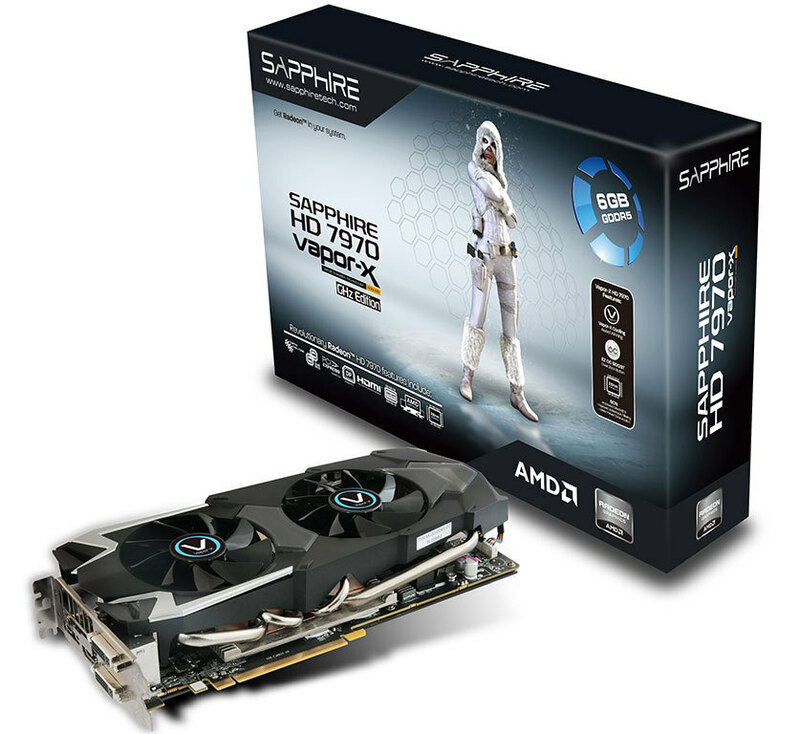 SAPPHIRE HD 7970 Vapor-X Editions are in production now and will be available through SAPPHIRE etailers and retailers.